A woman who only ate ice cream and sausages for 20 years said that the sight of fruit and vegetables made her feel physically sick. From the age of one, Courtney Baxter has struggled with a condition called SED (selective eating disorder) which meant that she could only stomach a diet of ice creams day and night. 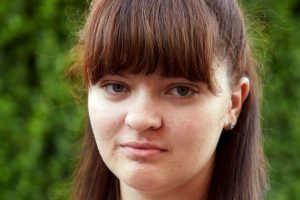 Courtney, now 21, was such a fussy eater that the sight of vegetables or fruit would make her feel physically sick and cause her to have a panic attack. But after eating more than 7,000 different ice creams and never going to a restaurant, Courtney knew she had to take control of her diet. She has now finally ditched the habit thanks to hypnotism. So after undergoing a two-hour hypnotherapy session, the teaching assistant has now been able to try a selection of new foods and is eagerly looking forward to her first ever date with her fiancé, Jared, after being together for seven years. Courtney, from Market Rasen, Lincolnshire, said: “I always felt safe whenever I ate ice cream, as I knew it wasn’t going to make me sick or wasn’t dangerous in any way. “I used to eat ice cream nearly every day. Because of the amount of sugar involved it was causing me to have health problems. From the age that she could eat solid food, Courtney remembers eating nothing but her restricted diet of ice cream and sausages. However, when even attempting to eat new foods led to her being sick, Courtney decided to stick in her ways. She said: “I felt useless. All I wanted to be able to do was eat fruit and vegetables and be able to have a healthy and balanced diet”. Now, after having one therapy session on June 30, Courtney’s palette has expanded and she has been able to try a variety of foods. She said: “When I was in the therapy session I just felt really calm during it, and when I woke up and had new food in front of me, I wasn’t scared any more. David Kilmurry, a cognitive behavioural hypnotherapist, said: “Courtney came to the Food Dr clinic to be hypnotised to bravely deal with her extreme food phobia – prior to the therapy she gagged as I asked her about vegetables. “When I heard that ice cream was her ‘safe’ food I was astonished. Sweets are not a treat if you have them as a safe food, and the health risks are huge. « Hypnotherapy: Can it really help you drink in moderation?